Many times as I look for more flavors I can bring out in a vegetable I turn to poaching, a French Technique used in many professional kitchens. 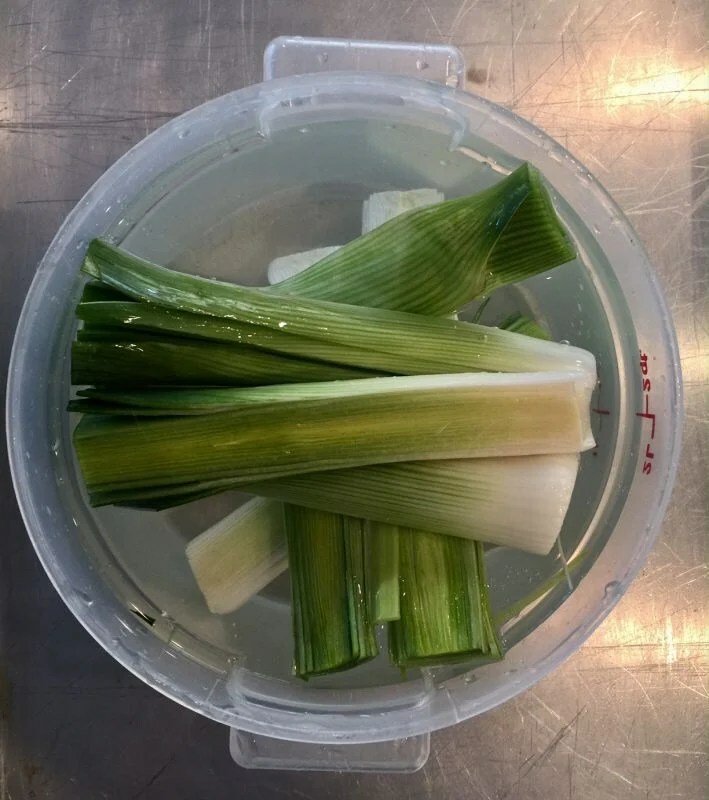 Leeks are used often in the Greek kitchen for many uses. They can be added to soups, stews, salads and appetizers, adding a sweet onion flavor where needed. In our book Cooking Techniques and Recipes with Olive Oil”, we poach with extra virgin olive oil in dishes such as fish, lamb and meats. 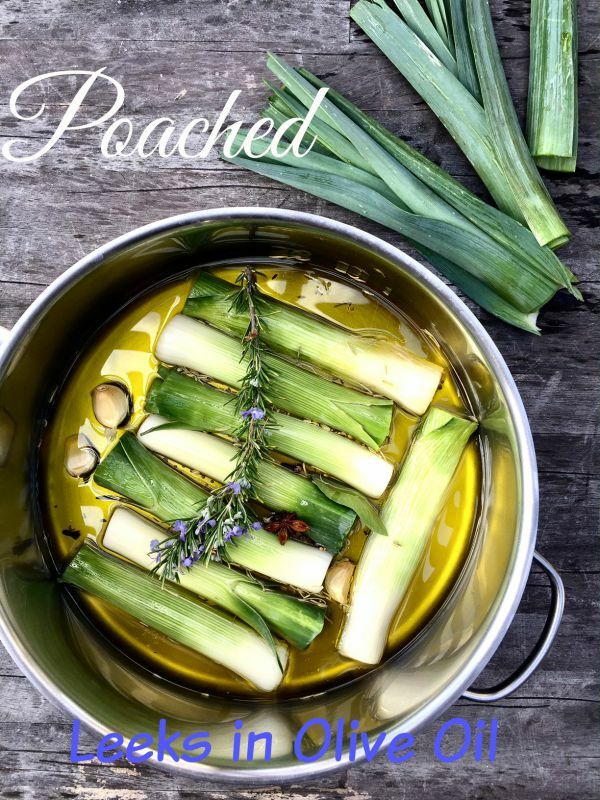 When you poach whether it’s with water, wine, juice or olive oil, it’s a low and slow method. The temperature should be 160-180 degrees, a gentle simmer. This enables the liquid you are using to penetrate the food. Today, I’m using beautiful long leeks, cut above the white line 2-4 inched depending on the thickness of the leek. Wash thoroughly, add the leeks to the olive oil and simmer until tender. Once cooled they can be placed in the refrigerator covered up to a week. Add them to your eggs, salads, pasta, pizzas and use them as a topping for any dish. I have several recipes on my blog where I have used this poaching technique. 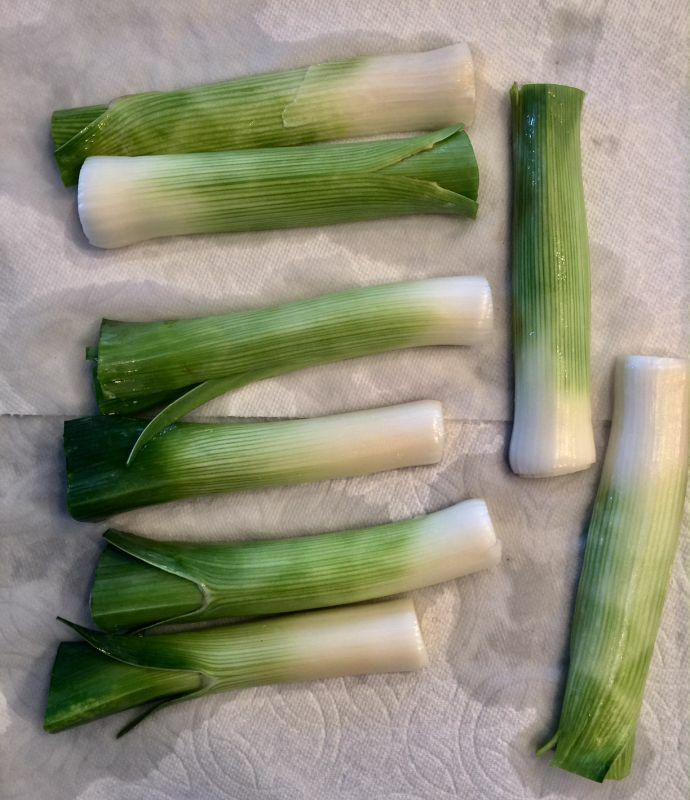 Cut the leeks in half after trimming off most of the green part leaving 1-2 inches. Remove tough outer leaves. Submerge in cold water and briskly shake to get off dirt. Place on paper towel to dry. Dry thoroughly before cooking. 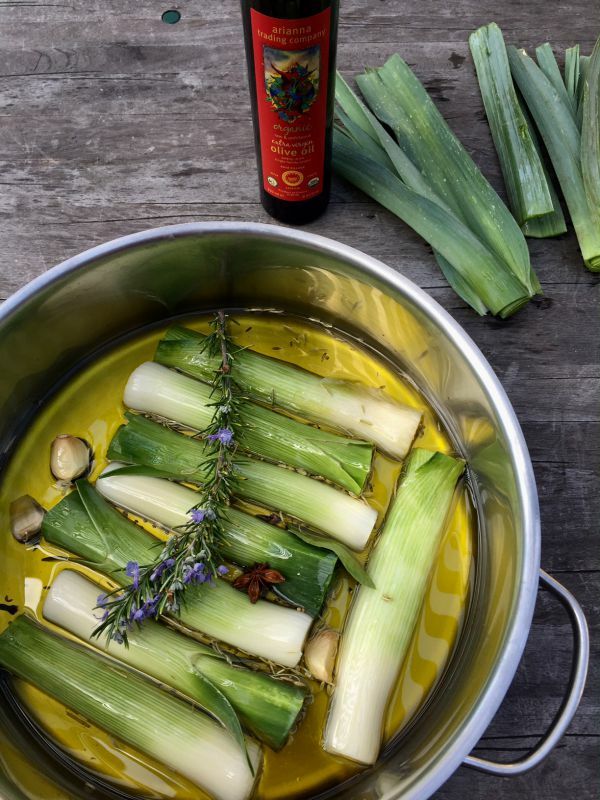 Add the dried leeks to a deep skillet or dutch oven, and add the aromatics and extra virgin olive oil. Make sure you use a fine extra virgin olive oil. A simple and incredible tasty dish using olive oil and this cooking technique. Poach and serve warm as a side or add to salads, pasta, or an omelet. In a large skillet add the fresh leeks, making sure they have dried thoroughly after washing. Make sure they are arranged in a single layer for even cooking. Add the spices and fresh herbs. Feel free to experiment and use your choice of flavors. Add the cold olive oil to the cold pan. Place the skillet on stove and heat to a very low simmer. Do not leave, unattended. You may want to use a thermometer to gauge the olive oil. You want to be between 140-160 degrees. Cook until tender 10-15 minutes. Remove from the heat and let cool. Refrigerate covered for up to one week. 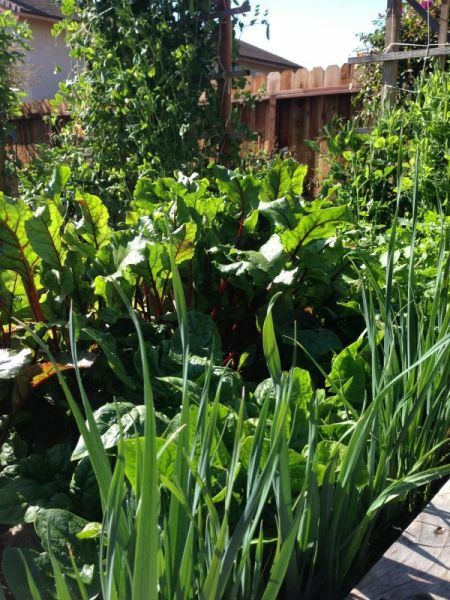 Here’s my winter garden and my leeks along the sides of the box. Once, you grow your own leeks it’s hard to go back to the sore-bought! They are so easy to grow, and I bet they would do fine in a large pot too! 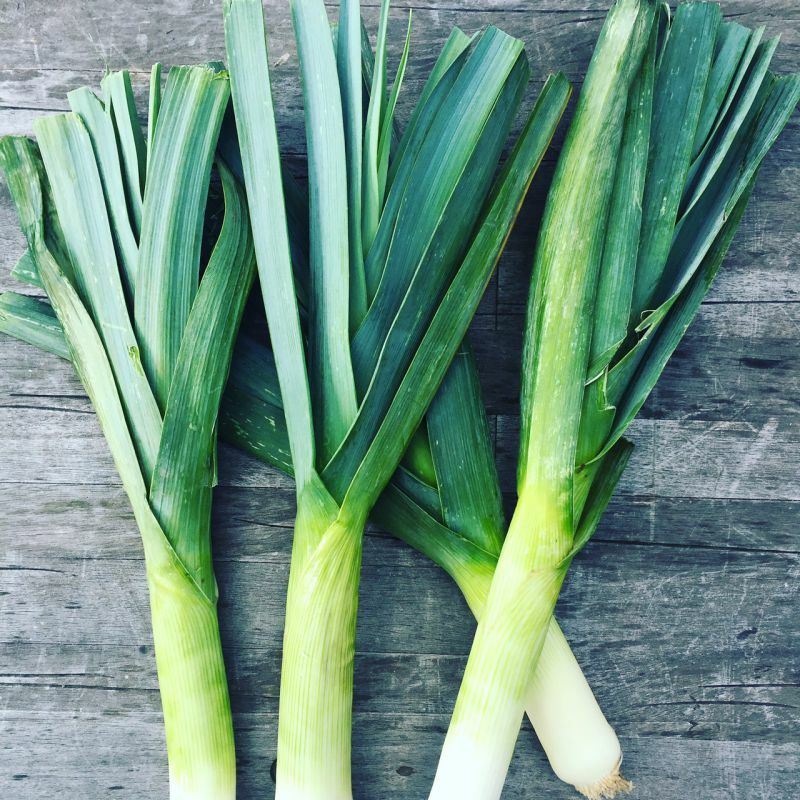 I use Burpee’s Leeks Dawn Giant variety. 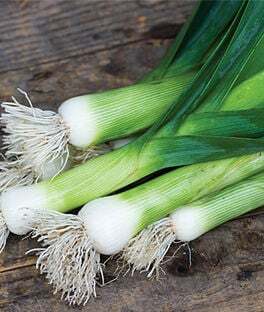 Do you re-grow your leeks and onions? I use my scraps for broth. But, I have seen this being done, with adding the roots to the soil – such a gerat idea!